1 The trend is a six-month moving average of the monthly seasonally adjusted annual rates (SAAR). By removing seasonal ups and downs, seasonal adjustment allows for comparison of adjacent months and quarters. 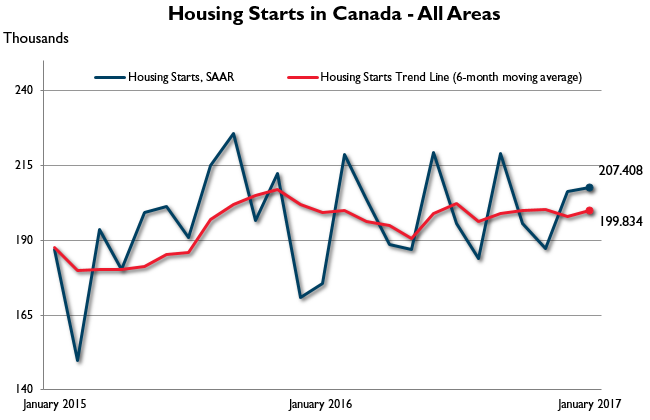 The monthly and quarterly SAAR and trend figures indicate the annual level of starts that would be obtained if the same pace of monthly or quarterly construction activity was maintained for 12 months. This facilitates comparison of the current pace of activity to annual forecasts as well as to historical annual levels.